One and only device of its kind in the world, Tx360EU is a revolution in medication injection. The Tx360EU Nasal Injector device is intended to inject fluids, selected by a healthcare professional, to the mucous membrane covering structures of the nasal pathway, such as the inferior turbinate, middle turbinate, superior turbinate, sphenopalatine foramen, nasal septum, etc. The Tx360EU provides an aid to physicians in the injection of drugs used as nerve block agents when performing sphenopalatine ganglion nerve block for the purpose of treating headaches. Dr. Tian Xia, is the sole owner of the company, had invented Tx360® device. It is currently available for sale in United States(Tx360®), and European Union Tx360EU). Tian Medical is located in Libertyville, IL. The company is primarily engaged in venture funding, research and development of biotechnology and life sciences. Tian Medical had developed the Tx360® and Tx360EU Nasal Injector. Tx360® / Tx360EU medical device is the one and only product of its kind commercially available for sale in United States(Tx360®) and European Union(Tx360EU) for use by medical professionals. Nasal passage irritation. Putting anything repetitively in the nose may irritate the lining of the nose. To help avoid irritation, use the device for only a short duration on each side of the nasal passage. Do not use for more than one injection. If the tissue the nose is bright red, appears to be irritated, or if the patient is experiencing pain, immediately discontinue using the Tx360EU Nasal Injector . Nose bleeding. Do not force the tip of the Tx360EU Nasal Injector into the nose. Insert the device slowly and carefully following the step by step instructions described below. If a nose bleeding occurs, immediately stop using the device and hold pressure on the nose to stop bleeding. * The Tx360EU Nasal Injector may cause nose bleeding and irritation when used in this condition. * The Tx360EU Nasal Injector may cause additional nasal trauma. * The Tx360EU Nasal Injector may cause nose bleeding and additional nasal trauma and irritation. Reuse of the Tx360EU Nasal Injector may cause serious infections and introduction of bacteria, such as VRE (Vancomycin-Resistant Enterococcus) or MRSA (Methicillin-Resistant Staphylococcus Aureus). What is SPG Block (Sphenopalatine Ganglion Block) and why should I consider it for my patient? The sphenopalatine ganglion block / sphenopalatine ganglion (SPG) is located just deep to the nasal mucosa posterior to the middle nasal turbinate. The SPG can be blocked by diffusion of local anesthetic through the overlying mucosa. Sensory, sympathetic and parasympathetic fibers pass through or synapse in the SPG, making it a key structure in various types of cephalgia. Temporarily blocking function of the SPG can provide prompt, and sometimes sustained, relief of pain. It is theorized that SPGB provides sustained relief by disrupting dysfunctional neuronal activity, allowing restoration of normal function. Getting serious about blocking headache pain. Currently there is very little to offer the chronic migraine headache patient. Nearly two thirds of patients discontinue prescription medications due to inadequate relief and side-effects. Although proven effective, few physicians offer the SPG block to patients because the traditional procedures are uncomfortable and dangerous for the patient and demanding for the care giver. Traditionally, the block is attempted by navigating a cotton tip applicator through the nasal passages and place it there for 30 minutes, or with a long needle through the side of the head. These approaches carry risks and sometimes require sedation. Today, establishing an SPG block has never been easier. The patented Tx360EU offers the practitioner the ability to offer a first-line treatment in the chronic headache patient. Tx360EU injects medication that can sustain pain relief in a ten to thirty seconds procedure that is comfortable and quick. With Tx360EU, SPG may be achieved without needles, cotton swabs, atomizer sprays or systemic narcotics. Tx360EU is a single-use, disposable catheter that injects medication through the nasal passages to a difficult-to-reach ganglion located at the back of the nose easily, safely, efficiently and accurately (only 0.6cc of medication needed). When used as indicated, Tx360EU injects the medication immediately proximate to the ganglion to achieve a Sphenopalatine Ganglion or SPG block. Interventional radiologists, neurologists, internists, emergency departments and pain specialists are interested in utilizing Tx360EU for a safe, comfortable and quick injection of the medication required for the SPG block procedure. The drug injection innovation, Tx360EU, is drawing the attention of physicians who treat patients with chronic and episodic migraine, cluster headache, and chronic daily headache and for other applications. The SPG blocks have been studied for many disorders for over a century. More recently however, the block has been associated with profound neuromodulation of the SPG complex, resetting the chaotic signaling associated with chronic migraine with both immediate and sustained results. Though widely accepted as effective, few physicians are willing to perform an SPG block because the traditional procedures are uncomfortable for the patient and demanding for the caregiver. Formerly, the block was attempted by navigating a cotton tip applicator through the nasal passages, by atomizing a spray or with a long needle through the side of the head. These older approaches carry risks, sometimes require sedation and may not be effective in all patients. Headache alone affects nearly 45 million individuals, and migraine occurs in 6.8% of men and 15-18% of women. Nearly two-thirds of headache patients discontinue prescription medications due to inadequate relief and side effects. The SPG block may also have utility in the treatment of other disorders. 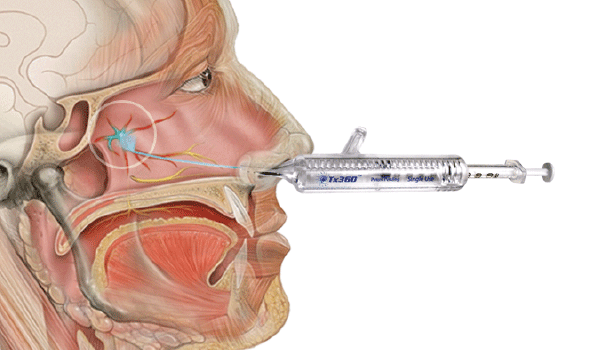 Tx360EU is designed to inject medicines right onto the sphenopalatine foreman in order to block the entire SPG apparatus. Tx360EU allows easy and accurate placement of medications right onto the sphenopalatine foramen, no imaging guidance is necessary. The past techniques utilized for the nerve block are very unreliable, complicated and painful. SPGB has been described in the medical literature for over 100 years. It has been proven effective for many painful conditions. The main limitation to the procedure has been that it is the discomfort and risks for patients, the inconsistency of medicine placement impacting results. Therefore the clinical use of this therapeutic modality has been much under-utilized at present. This technique attempts to drip local anesthetic down the Q-tip to access the SPG. The process takes 25 – 45 minutes and has a low success rate due to the inaccuracy of the application. This technique attempted to access the SPG with a needle through the jaw joint. This technique is very painful and moderately dangerous. The success was much better but was still inaccurate and inefficient due to cost.